candy station - sweet buffet adds the wow factor to any event! 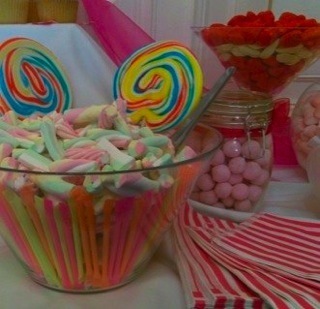 Make Believe provide fantastic Candy Stations, perfect for a range of different events. We often provide our Candy Stations developed towards particular colours or themes. party bags with the added benefit of the visual display and the interactivity of each guest being able to select their own mix - jars full of bouncy balls or fans of glowsticks look great next to the sweets! If Make Believe aren’t hosting your party then the minimum number catered/paid for is 50 starting at £1.75 per head. pick and mix their favourites.